CATER FOR A FEW OR A CROWD & PLEASE EVERYONE! Chicken Shawarma (gluten free, dairy free), roasted Beef (dairy free), roasted Lamb (dairy free) and vegetarian Falafel (vegan, dairy free) then grilled to perfection. Tasty side trays of fresh veggies, Middle Eastern pickles, creamy Tzaziki sauce, ZamZam’s Garlic Mayo and in-house Hummos dip (vegan) are also included. 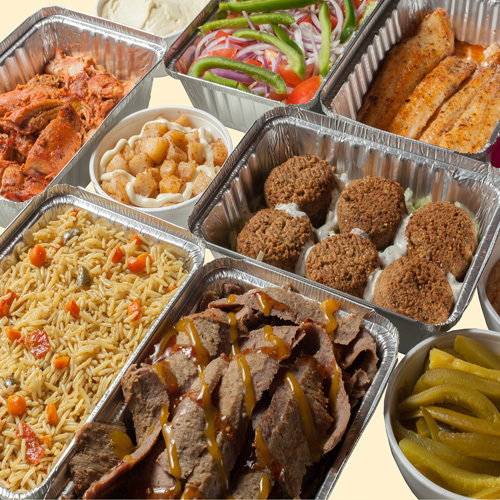 Add a tray of Vegetable Basmati rice, Tabouli salad (vegan), Zotatoes (roasted potatoes – vegan), Granny’s Special, Mama’s Spinach, Lentil Hero, Chana Chat, and Pistachio Baklava. FOR SPECIAL OCCASION OR ANY OCCASION! 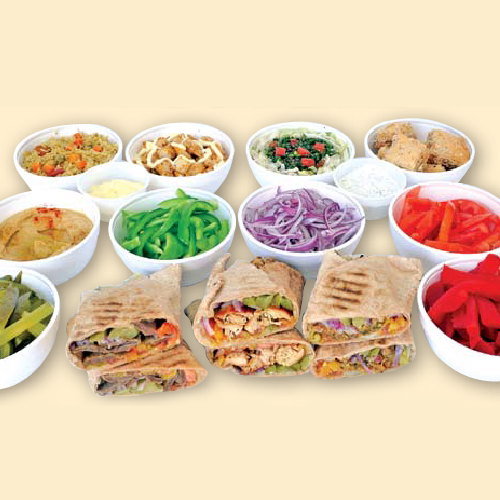 Add a tray of Tabouli Salad (vegan), Granny’s Special, Mama’s Spinach, Lentil Hero, Chana Chat, and Pistachio Baklava.